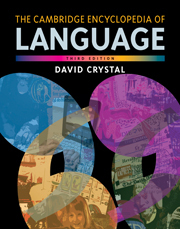 This new, thoroughly revised edition of the acclaimed Cambridge Encyclopedia of Language incorporates the major developments in language study which have taken place since the mid 1990s. Two main new areas have been added: the rise of electronic communication in all its current forms from email to texting, and the crisis affecting the world's languages, of which half are thought to be so seriously endangered that they will die out this century. Preface to 1st edition; Preface to 2nd edition; Preface to 3rd edition; Part I. Popular Ideas About Language: 1. The prescriptive tradition; 2. The equality of languages; 3. The magic of language; 4. The functions of language; 5. Language and thought; Part II. Language and Identity: 6. Physical identity; 7. Psychological identity; 8. Geographical identity; 9. Ethnic and national identity; 10. Social identity; 11 Contextual identity; 12. Stylistic identity and literature; Part III. The Structure of Language: 13. Linguistic levels; 14. Typology and universals; 15. The statistical structure of language; 16. Grammar; 17. Semantics; 18. Dictionaries; 19. Names; 20. Discourse and text; 21. Pragmatics; Part IV. The Medium of Language: Speaking and Listening: 22. The anatomy and physiology of speech; 23. The acoustics of speech; 24. The instrumental analysis of speech; 25. Speech reception; 26. Speech interaction with machines; 27. The sounds of speech; 28. The linguistic use of sound; 29. Suprasegmentals; 30. Sound symbolism; Part V. The Medium of Language: Writing and Reading: 31. Written and spoken language; 32. Graphic expression; 33. Graphology; 34. The process of reading and writing; Part VI. The Medium of Language: Signing and Seeing: 35. Sign language; 36. Sign language structure; 37. Types of sign language; Part VII. Child Language Acquisition: 38. Investigating children's language; 39. The first year; 40. Phonological development; 41. Grammatical development; 42. Semantic development; 43. Pragmatic development; 44. Language development in school; Part VIII. Language, Brain, and Disability: 45. Language and the brain; 46. Language disability; Part IX. The Languages of the World: 47. How many languages? ; 48. How many speakers? ; 49. The origins of language; 50. Families of language; 51. The Indo-European family; 52. Other families; 53. Language isolates; 54. Language change; 55. Pidgins and creoles; Part X. Language in the World: 56. The language barrier; 57. Translating and interpreting; 58. Artificial languages; 59. World languages; 60. Multilingualism; 61. Language planning; 62. Foreign language teaching and learning; 63. Language for special purposes; Part XI. Language and Communication: 64. Language and other communication systems; 65. Linguistics; Appendices: I. Glossary; II. Special symbols and abbreviations; III. Table of the world's languages; IV. Further reading; V. Index of languages, families, dialects, and scripts; VI. Index of authors and personalities; VII. Index of topics; Acknowledgements.